My novel Julia's Child comes out two weeks before Valentine's Day. (Attention male readership, that's in February.) When I was in grade school, it was with great joy that I carried 24 cute little envelopes to school one February day a year, and distributed them to the far corners of the classroom. If you could see my desk right now, you'd assume Valentine's Day was just around the corner. 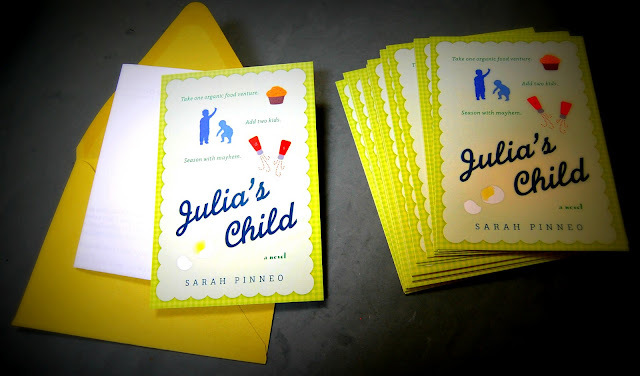 There are dozens of pretty envelopes everywhere, and a toppling stack of Julia's Child postcards. With four months to go, you might think I'm crazy. But some of these pretty letters are headed to bloggers, with a letter enclosed, asking if they'd be willing to review the book or host a stop on my blog tour. And some of these are headed to area bookstores. I live in northern New England, in a region thick with independent bookstores. Many will receive a polite letter which basically says: Dear store, I live nearby and this is my book. It even has a Vermont plot line. I'm available for book group meetings, should I be so lucky to have a book club choose my humble work. And you look really nice in that outfit. The subtext is: please order me! I would love to think that my publisher's salesperson has the time to mention to nearby bookstores that the author of the new book on page 20 of the winter catalog is local. But why take the chance? For $0.60 (including postage) I can make the point more personally. But the lion's share of these cards will eventually end up in the mailboxes of people I know. My smart and funny critique partner Rosemary DiBattista once told me that the best book publicity advice she'd heard so far was to make "a giant Christmas card list" and tell everyone you know when the book comes out. And doesn't that make sense? It matters little if your high school friends on Facebook have a vague notion that someday your book will be published. The people most likely to support your efforts deserve a good old fashioned postal prompting. "I did it! It's finally here!" Every day I address a couple of envelopes. The ones for friends and family get placed into a shoe box. The ones for bloggers and bookstores go into the mail. When February comes, I'll have done all I can. You can get 500 postcards for about $40.00. Or, if you explain to your publisher's marketing person what you intend to do with them, a box of cards just might end up on your doorstep. So come on, now. Send us a valentine. What a wonderful and smart idea. I'm sure you'll be the Valentine of lots of people this February! "And you look really nice in that outfit" gets ME every time--why shouldn't it work for book stores? Love the cards, by the way. Those postcards are beautiful, Sarah! I'm just doing the same thing right now, but with my marketing cover flats!